Summer has beach, pool and lake days; fall has beautiful foliage and pumpkin spice everything; winter has holidays and winter sports; but spring has literally everything that’s good and right in the world. The days are longer, flowers and trees are in bloom, you don’t have to look at your winter coat for approximately 270 days, outdoor sports are in full swing, and most importantly, there are baby animals everywhere. Why do so many animals have their babies in the spring? There’s more food available, and because the days are longer, the mamas have more time to find chow. Plus, warmer weather and regular rainfall maximizes plant, a.k.a. food, growth. If you’re not already psyched for springtime, these spring-lovin’ baby animals (and some fun facts about them!) will surely put you in the al-fresco-dining-and-never-wearing-socks-again state of mind. Bunnies are the cute, fuzzy mascots of spring—whether they’re domesticated, wild, made of chocolate or actually a human in a rabbit costume. The more you know: It’s well-known that bunnies are born in spring and they have huge litters—mama bunnies can give birth to up to nine babies each time. But did you know baby bunnies are actually called “kittens?” Yep, they just got even cuter. The more you know: Baby deer, otherwise known as fawns, stay with their moms for about one year before they finally grow up and get a job, already. Baby raccoons are so stinking cute, you may be able to overlook the fact that they’re rifling through your garbage at all hours of the night and stealing from the birdfeeder. Maybe. The more you know: In the wild, raccoons will travel a massive 18 miles to forage for food; in urban areas, however, they’ll venture about one mile from their den in search of dinner. Visit a local farm during the springtime and you’ll probably hear what sounds like humans screaming. Fear not: It’s (hopefully) just the fresh batch of baby goats bleating in celebration of the season. The more you know: Just like human beings’ voices vary from region-to-region, goats have unique accents. A goat’s bleat in New Jersey will sound different than a goat in California. Most people may not think of otters as springtime animals (or is that just me? ), but otters usually mate in the winter and give birth to their pups in the spring. The more you know: Otters have the thickest fur in the mammal kingdom—they can have up to one million hairs per square inch. It helps keep them warm, dry and buoyant. We all know skunks can smell really bad, but let’s admit it—sometimes human babies do, too. Baby skunks are so tiny and adorable, it might be worth it to just plug your nose. The more you know: Speaking of their defensive musk, skunks can spray a target from a whopping 12 feet away! If bunnies are the mascot of springtime, birds are the soundtracks. Is there any feeling better than lying in the park and listening to bird songs? I’ll tell you: There isn’t. Plus, baby birds are super cute in a featherless, bug-eyed, alien sort of way, right? The more you know: Some birds lay their eggs in the nests of other birds, rather than building their own, so some babies grow up with siblings of entirely different species. 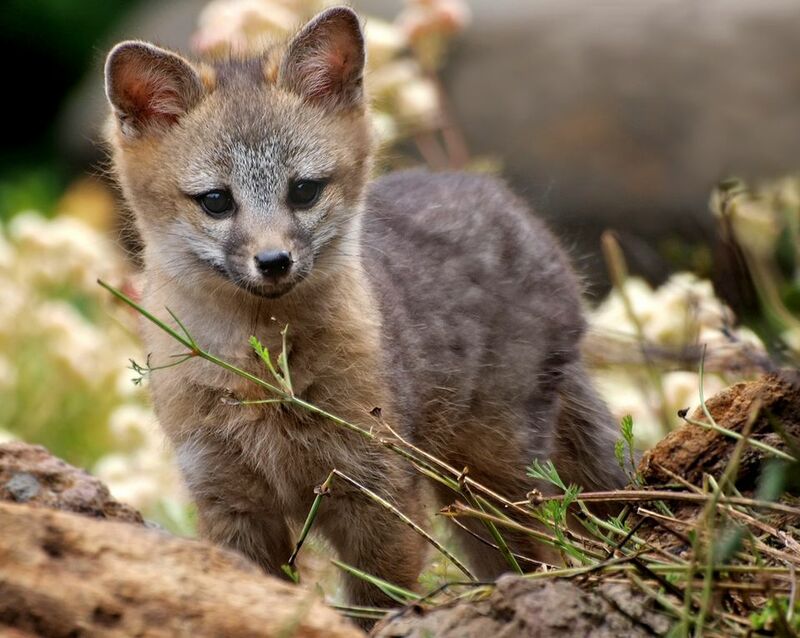 Although wild foxes are nothing like sweet, sensitive Tod (voiced by Mickey Rooney, oddly enough) in the Disney classic The Fox and the Hound, they are pretty cute and fluffy. Just don’t try to pet them. The more you know: Research determined that foxes can actually see the earth’s magnetic field—and use it to hunt their prey. How? They see the magnetic field as a shadow in their vision. When that shadow lines up with sounds from their prey, they pounce. If you’ve ever seen a chubby porcupine lumber across the road, you’ve definitely squealed like an excited little girl. Just look at that face! The more you know: Baby porcupines are born with long, soft hairs that transform into sharp quills within a few days of their birth. Chipmunks are tiny, woodland creatures with chubby cheeks, big eyes, good eyeliner and fluffy tails. There’s literally nothing un-cute about them. The more you know: In just a single day, one chipmunk can gather as many as 165 acorns; in two days, they can fully stock their snack cabinets for the winter.